Treasure Island, a former U.S. Navy base and World's Fair venue, has spectacular views of the Golden Gate, San Francisco skyline, Alcatraz, and the east bay. It also has artifacts from its grand past and eclectic future around every corner. If that weren't enough, it is flat as a pancake and has relatively calm or sparse car traffic, making it a perfect place to tour by bike. Unfortunately, there are few ways to get there. Currently, it is just boat or car/bus. Even coming by boat is tricky because there are not many places to dock and disembark. Coming by car, of course, is well supported by the transportation infrastructure but often jam-packed when you most want to use it. The new eastern span of the Oakland/San Francisco Bay Bridge, which ends at the midway point (Treasure Island), was designed to help matters for the car-free. Included in its design is a separate bicycle/pedestrian lane along its southern edge. Sadly, as of 2015, there is a major limitation to this new half of the Bay Bridge. Its beautiful new bike lane is on a collision course with the old span which is not yet demolished. Consequently, it ends mere feet from the delectable Treasure Island. No cycling to Treasure Island for now. UPDATE: The bike lane is now scheduled to open in 2016. Woohoo! See more on that here. The incomplete Bay Bridge bike lane may stop you from cycling to the island for now. However, it cannot stop you from cycling on the island without a car. Bus service in the U.S. is patchy. Some is quite good but many times folks write it off because of punctuality, reliability, and the generally long waits between each bus trip. Bringing a bike on the bus brings the added challenge of finding a bus with empty bikes racks, or racks at all. Most buses only have two bike racks. In the bike-intensive bay area, those slots can often be full and you can get left behind. Regardless, PlanBike decided to give it a try. To mitigate the risk of not getting one of the bus's bike rack slots, a folding bike comes in very handy. If the racks are full, folding bikes can typically be folded and brought on board as luggage. In fact, this capability makes the folding bike an increasingly popular choice for cycling in urban settings. If you truly want to go carless, the reality is you need to leverage other transportation infrastructure from time to time: to avoid dangerous freeways and span great distances fast. The folding bike plays nicely with planes, trains, buses, and cars. It works perfectly for a bus/bike trip to Treasure Island. The SFMTA (San Francisco Municipal Transportation Agency) aka SF Muni runs a shuttle (the 108) to and from Treasure Island about every half hour, 24 hours a day. That's impressive in a town where the primary light rail services (BART and Caltrain) don't even run round the clock. The 24 hour service is understandable for an island with a lot of residents that may not have a car but will eventually really need to get off or on the island any time of day. On a Saturday afternoon in March, service worked well. 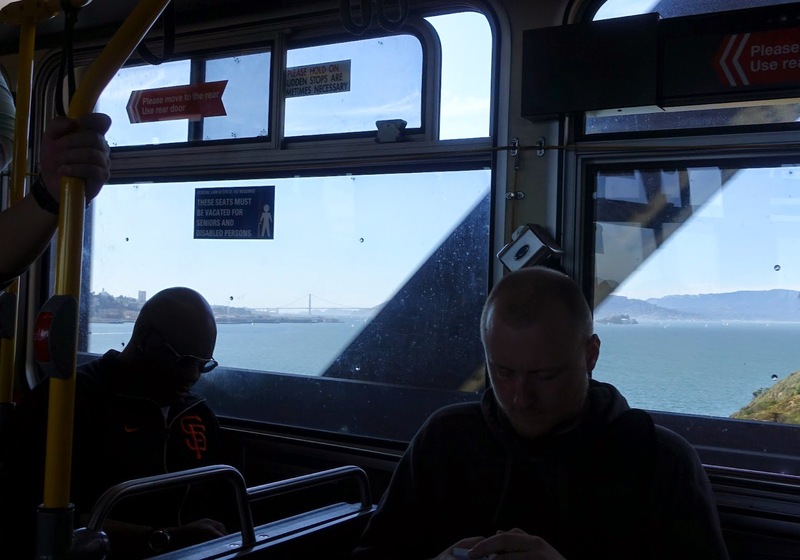 Despite the 2:57 p.m. bus showing up at 3:07 p.m. and a car accident on the west span of the Bay Bridge, the bus ride was swift and peaceful. The trip took no more than 20 minutes and the time passed quickly because the ride was full of breathtaking views of its own. As you come off the bridge and down the main road on the west side of the island, you already get a panoramic view of the San Francisco skyline and the Golden Gate. Once on the bike, you can circumnavigate the whole island in less than an hour but won't because there will be a winery, ship's cannon, marching band practice session, art show, or striking view that will grab your attention. When you are ready to ride back, there is more than one stop where the same 108 line will pick you up. A word of advice: cycle to one of the bus stops before the last one on the west shore onramp. It will help you avoid cramming onto a jam-packed bus if it is a busy day. The bus back was more punctual but was indeed more crowded, as you might expect on a weekend afternoon. Of course, a bus every 15 minutes, instead of every 30, would be great but overall the bus experience with bike was very nice. The round trip travel time from downtown San Francisco was 40 minutes. Pretty good for any travel mode. When the new bike lane opens, it may become the more attractive way to visit Treasure Island by bicycle. Nevertheless, getting there carlessly is already quite painless, pleasant, and certainly worth the trip.